Every Friday, with eagerness to share the wisdom and guidance contained in the Quran and Hadith, the Khateebs prepare their Khutbahs by carefully selecting verses from the holy book and citing examples from the life of the Prophet Muhammad <pbuh>. And equally important, the attendees, in increasing numbers, are coming to learn from these Khutbahs and join their fellow Muslims in Salaat & Duas. To accommodate the growing numbers, many organizations are scheduling a second and a third session, while some are expanding their mosques to facilitate this ‘teacher & the taught’ sessions . These weekly Khutbahs, in other words, are a Knowledge Sharing <KS> session essential to Islam. And the Khateebs while fulfilling this obligation also hope that what they share on various topics results in good Aamal (actions) that will strengthen not only their faith and bring the attendees closer to Allah<swt> but also will further enhance the image of what Islam & Muslims are all about individually and collectively – nationally & internationally. One would think that these sermons will continue to emphasize the value of life <protecting it, not killing innocent souls>, enjoying the freedom and liberty the country offers to practice your faith, looking for opportunities to do lasting-good with neighbours and in the society-at-large, standing firm for justice and fairness, refraining from misleading, deceiving, on being a good neighbour, etc. For the Khateebs, these weekly Khutbahs are a blessings from Allah<swt> to them as a unique opportunity to sow seeds for “Sawab-e-Jaaria” (or sadaqa jaaria – a continuing act of charity even after death)… This will happen if the message is remembered and acted upon. Did the Khateebs achieve their objective in sharing knowledge? Did the Khutba make an impact on those that attended the sermon? Is too much information being shared – information overload? How can we do ‘better grounding’ to enhance the relevance to present-day living? Why was the message sent not received? Is there a communication barrier? In finding answers to such questions, the Masjids will have done a great favour to their congregations and will enhance the objectives of these Khutbahs by bridging any Knowledge Sharing Gap. Knowledge Sharing is a communication process. Like all communication processes, there always is ample room to deliver information effectively, enhance retention of knowledge and bridge any gaps in the process such that our Aamal changes positively and it reflects in our behaviour and Muslims are viewed, individually and collectively, as positive change-agents in strengthening the communities in which we reside. As a starting point in the Knowledge-Sharing process, three categories come to mind …. The Audience, the Senders and the Messages. Following are some thoughts related to these categories. It is important to realize that unlike the Jumah-Khutbahs in our native lands where the language of the Khateeb and the attendees is the same, both represent the same culture, tradition, etc., the Jumah congregation here is comprised mostly of immigrants and first-generation immigrants. Khateebs may vary in nationality with varying accents, representing diverse cultures, traditions etc. As such, it is important for Khateebs to keep the diversity of the audience in mind as they share knowledge. Khateebs must remind themselves to ensure ease in hearing. Many attendees are not well-versed in English. It will enhance the impact of the Khutbahs should the Khateebs make it a point to speak slowly, enunciate clearly, yet loud enough and in an accent that is easy on the international ears. With clarity of delivery will come clarity & depth of understanding and will result in good Aamal (actions). Khateebs should always keep this opportunity to sow seeds of Muslim-Aamal. Yes, once again, it is a sawab-e-jaaria … a weekly gift for the Khateebs! 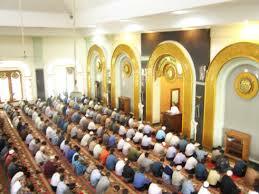 KHUTBAH: It is the key component of Friday prayer. Remember that there awaits for you a captive-audience that is knowledge-thirsty. It is an opportunity to share with them what is good and what is not so good, what is desirable and what is prohibited, what is good for the body and what is good for the soul, etc. They want to learn; so each them. Share knowledge in such a manner that they can remember, implement it and share with others. In short, let the congregation know what’s in it for them as you discuss each topic. Give examples that are “STICKY” in nature. Embed the concept that positive modifications in their behaviour not only impacts them, as individuals, but the Muslim-community nationally and inter-nationally. Once again, it is paramount to remember that the audience to whom you are ‘preaching’ is a diverse group from several perspective such as variation in age, language skills, profession, educational, cultural background and, more important, their level of conviction. It will be desirable for the Khateebs, as they prepare & deliver their Khutbahs, to clearly think of what they would like the audience to take-home. Upfront, alert the audience about the topic of the sermon you are about to give so that they can link in their own minds your statements, comments with this topic as you deliver the Khutbah. Another simple way is to use the TV screens in the mosque to not only announce in ENGLISH the topic of the sermon but also cite <the Chapter/Verse> a couple of Ayats and references to the Hadiths <Bukhari, Tarmeedi, etc.> that you intend to discuss. For a good teacher expects the students to go back and read gain from the original source; encourage them to do that by taking a picture of the TV with the references. Repetition is important for memorization; and recall/remembrance of Ayaats & Hadith is important for behavioral changes. Repeat the topic as much as possible during the sermon; how this topic relates to all in attendance, why it is important and how it can be beneficial to them. Secondly, when you quote from the Quran, please indicate the Chapter & the Verse clearly and when a Hadith is cited, please give the reference also. In the second half of the Khutbah, prior to dua, please take time to once again remind the audience as to what you told them and how they can put into practice in their daily lives the knowledge that you shared with them. In short, as the adage goes, tell them what you are going to tell them and then, tell them and, finally, tell them, again, what you told them. It is important for the Khateebs to remember — Unlike in a class room setting where the teacher-and-the-taught have a dialogue and the students can ask for clarification and they take notes for future recall & retention, the Khutbah is a monologue, and no one is taking notes for future recall and practice. The goal is to ensure that the points made in the Khutbah by the Khateeb are understood clearly, memorized & put to practice. Mission Accomplished, should this occur! The more the Khateeb can “ground the concept” by giving examples <local/regional, preferably> from our present day lives, the more likely it will be remembered and practiced. Individuals tend to embrace & adopt concepts faster when they realize what is in it for them. Let those in attendance know that if they were to take one point from this Jumah-Khutbah what that would be. Repeat this point, if you must. Encourage them to jot this point on a paper as soon as they go home or back to work. As a reminder to them and their loved ones, suggest that they post it on the refrigerator or their desk or even keep it in their wallets/purses. In doing so, you have armed them with Islamic knowledge to deal with day-to-day challenges of life, in a manner our Prophet<pbuh> showed us. When reciting Dua as you conclude the sermon, make it such that everyone in the audience, your students, can understand what is being said. Do take time to translate into ENGLISH what you are saying in ARABIC. Needless to emphasize, Dua is the essence of worship and everyone can relate to the Duas that seek enhancing of ones’ patience, asking for good health, the speedy recovery of those who are sick, ease of pain for those experiencing difficult times, protection from the Devil, asking for HIS mercy, compassion, forgiveness etc. When individuals can relate to Duas, they find solace & inner-peace… it is like re-charging their spiritual battery. The Khateebs can help increase the battery life. When Duas are understood there is greater passion in the asking and sincerity when they say, “Ameen”. Understanding what the Khateeb is praying for helps rejuvenate the congregation, offers them hope, solace and comfort and prepares them for the challenges in their lives. PRAYER: Once again, know the make-up of your audience. Be aware of the age differences in the congregation. With old-age, comes physical aches and pains in standing, sitting or bending for long periods of time. And, when in pain, the concentration tends to waver impacting, the Khushoo. As you lead the prayer consider the fact that all in attendance are at the same level of conviction. Keep the Rakahs short. And preferably recite those Suras that most of the audience have memorized. This is a suggestion for at least two reasons. The first is when you are reciting these familiar Suras, the congregation will undoubtedly be fully in synch with you and possibly repeating it quietly as you recite them. Second, as you recite these Suras with tajweed, the audience will also be able to correct their own pronunciation of the words of the Suras when they are praying at home. In doing so, you have also taught a bit of Tajweed to the congregation while leading the prayer. A teacher never stops teaching! In keeping your audience in mind, keep the Ruku & Sujud short. Factors to remember include that Friday is a work-day and the lunch-break is usually an hour, minimization of the aches/pains of the ageing population in the congregation, other factors such as inclement weather conditions, the traffic concerns, etc. it is worth remembering that communication is the essence of all relationships, especially between the teacher-and-the-taught. TIME: This is an important point to follow from multiple perspectives. While it is un-Islamic to keep people waiting, it is customary and fashionable in some cultures to be late. Punctuality needs to be re-enforced, both as a respect for others who are on time as well as the limited time allocated for lunch-breaks for those who are working. With iPhones being common, the Khateebs themselves can keep track of time – all the way from the start of the Khutbah to the completion of the Salat. PROPOSAL: Teaching is a profession. It is time for the Khateebs to start their own professional association and establish a network of experts. It could be a sub-set of, as an example, the ISNA <Islamic Society of North America> or any stand-alone body. Regardless of its nomenclature, there is a lacuna here that must be addressed. Take the lead form other professions and establish an organization. As with any professional activity, there are multiple and lasting benefits with an organized approach in any profession. One of the key benefits of such an organized effort would be enhancing the impact of Khutbahs by learning from each other… such as what are the DOs and DON’Ts. Like all organized professional associations, the group would have a central web-site to connect with other Khateebs. It could be a peer-reviewed site and under the aegis of national Islamic organization to ensure legitimacy. This could be a site to share ideas and experiences of the various Khateebs. Yes, Khateebs in Islam and other organized religion… yes, there is much we can learn from them in the art of Knowledge Sharing and spreading peace within the community during stable as well as in turbulent times. Additionally, like delivering good talks, the Jumah Khutbah preparation takes time. A suggestion here is if a standardized template is developed, the Khateebs can highlights the topic of the Khutbah, the citations <Chapter/verses> pertaining to the topic from the Quran and the related Hadith <with references> and these can be stored and made available to other Khateebs for future Khutbahs. This will be a significant time-saver as many of the Khateebs are also working full-time and performing this valuable service for their community and in the service of Allah<swt>. The template does not have to be complex. Within a year or two, this accumulation of templates from all over USA would become a valued source of reference not only for the Khateebs for future sermons but also for those who would like to recall the specifics mentioned in the Khutbahs. Khateeb are the conduits and the harbingers of the values in Islam. Needless to emphasize, they play a vital role in our communities as role models for the young and old to emulate. Continue to share such messages from the Quran & Hadith that can be grounded in our daily lives. Remember that there is always room for improvements in enhancing the impact of the Khutbahs. Ameen!